I was one of nine bridesmaids for my friend's wedding in London (yes nine, it was an Indian wedding after all). For the ceremony, we wore the most beautiful royal purple and magenta sari with gold accents and embellishments. The colours and detailing are simply gorgeous. If you're not familiar with what a sari is, it's a long strip of unstitched cloth that is draped over the body in various styles and a blouse worn on top, cropped at the midriff. Surprisingly, I managed to not trip walking in it with five inch heels no less (which is a feat in itself). 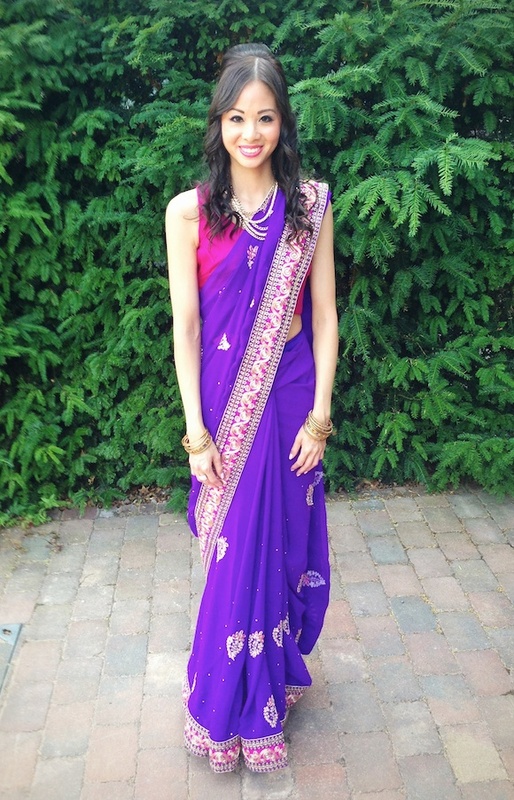 It was my first time wearing a sari and I felt like an Indian princess for the day. Saree is all about the Ultimate Beauty that is represented by women's soothe and adore in some unique way, wearing saree no doubt just adds more start to women. you have shared wonderful blue designer saree.